So, I've seen the movie, lots of gadgets, explosions, in short, it was awesome. I haven't seen much product placements, at least in terms of gadgets. If you have any high res screenshots that you want me to identify, I'll try my best to identify it. Anyways, here are some of the gadgets I've seen in Iron Man 2. It's easy to identify mobile phones in movies, just look for who's sponsoring the film. In this case, it's LG. So, Penny Pott's mobile phone is sort of a flip landscape phone while the front looks like a regular mobile phone. I wasn't able to get a closer look but it could be any of the LG EnV mobile phones shown below. When Tony was trying to figure out a new element while watching his father's videos, he was busy reading a book and tapping away on his PDA or nowadays, it might be a smartphone. Now this is a bit tricky. I don't know any LG phones with a flip cover. Touchscreens with flip covers are Motorola's specialty but I don't think the latter is a sponsor on the Iron Man 2 movie. Anyways, here's the closest phones I could find that match Tony Stark's phone in Iron Man 2. When Scarlett Johanssen was first seen in the movie, Tony Starks was boxing and he decided to do a research on Scarlett on a table that's also a computer. 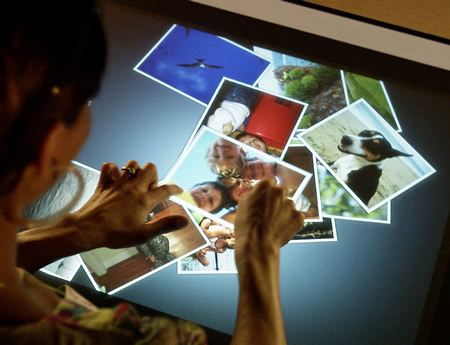 Now while this seems futuristic, Microsoft Surface has already been around and almost does the same thing. Now this is easy. Tony Stark's car are easy to spot because Audi has already released a press release announcing what models were featured in the movie.